We examine the process of story-telling via the iPad and picture book paradigm, with author/illustrator Mike Austin and his agent, Rubin Pfeffer. 4. Take us through the steps in transitioning from bookmaking to iPad parlance. Did you “play” with many other apps, while creating additional sketches and ideas? Mike Austin: It took a lot of noodling to get the pages working in a way that made sense for the iPad. I had to condense most of the spreads into single pages, split some spreads into separate pages, and then think about how Milo, the mouse, and all the other little pieces were going to interact once animated. I looked at bunch of other apps to see how they handled page structure, pacing and animation which helped a little. This is all new to me, so I had to figure it out as I went along. It was a very complicated puzzle, and incredibly time consuming, but I think the next one will be much easier. Rubin Pfeffer: My first app also. I always think of picture books as experiential reading. This is a story app. Creators using the new technologies now offer readers many other ways to experience the story. I’m not saying that digital apps replace picture books. Nothing could be further from the truth. Digital story apps are a different medium, with different outcomes. Not better. Different. We often said (to ourselves) “just because we can do it, doesn’t mean we should do it.” We tried to stay true to the goal. Any “taps” and surprises should happen to further the story line, and not just to “wow” ourselves or the readers. 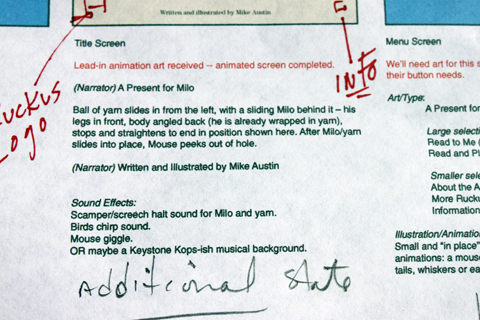 Assorted sketches, notes, storyboards for "Milo"
5. You then worked with Sequel Digital, a digital design and development group. Would you take us through what it was like working with them? Were there many revisions along the way? How many people were in your Sequel Digital team? Mike Austin: Rubin put me in touch with Ken and Sharon Streger at Sequel Digital. It was just the four of us: Rubin, me, Ken and Sharon. We had most of our meetings via Skype video. It was really a fun way to work together. I live in Hawaii, and they’re in Connecticut. So we would set up a video chat around 8 am my time, 2 pm Eastern. Sharon would email me pdfs of the storyboard with a list of agreed upon actions, sound effects and narration typed out for each screen. 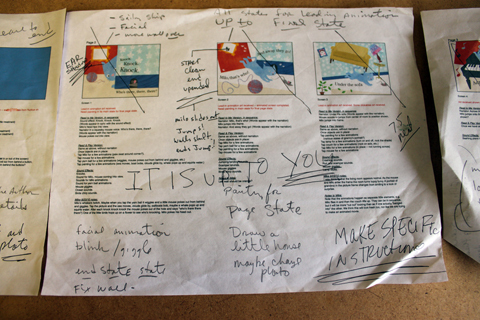 I would print it out and use that as my guide, scribbling notes to myself as I went through each piece of the puzzle. Rubin Pfeffer: Yes, Sharon kept the chaos in order. She was command central, knowing what kind of additional materials, illustrations — “assets” — would be required of Mike in order to make anything move or appear. She is an excellent designer as well, and had an immediate affinity to Mike’s graphic style. 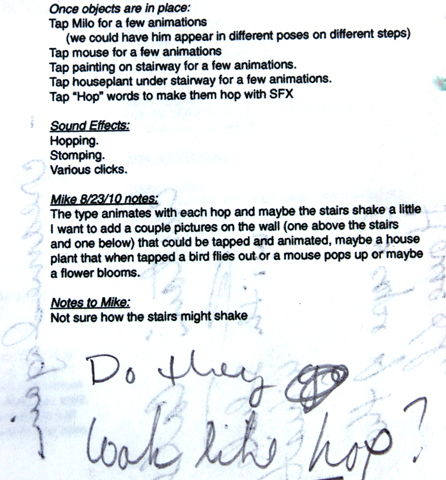 Sharon’s notations were the “to do lists” for Mike and for Ken Streger. Sharon mapped it out on paper. Ken built the systems that make the app perform. Mike Austin: We’d nail down the lead-in animations (the animation that occurs when a new page loads). 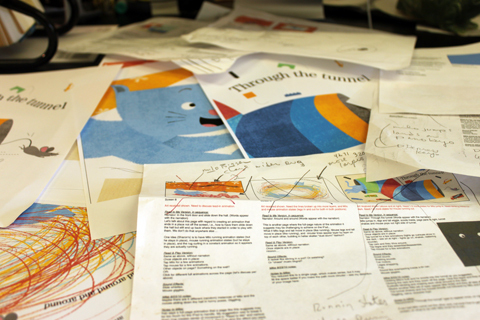 Once the lead-in animation ends, then the reader can begin exploring the page. We figured out how many “clickables” we could have on each screen, and whether or not they enhanced or supported the story. I had a lot of crazy ideas like the walls flying apart, stuff spinning around, etc., all happening at the same time. Ken had to keep reminding me that if you have too many big complex things happening at once the program will crash. 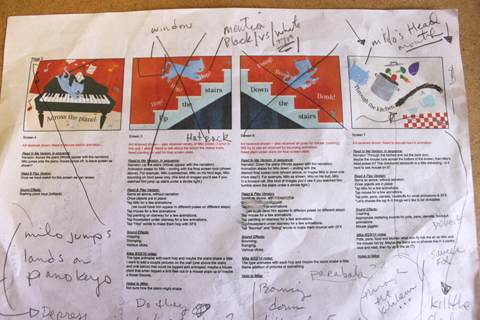 I had to think smaller, less complex sequences — although there is one screen that fills with scribbles. Ken and Sharon made it work brilliantly. Once we decided what could be “clickable,” we had to figure out the different animations that could occur for each clickable. For example, the sailing picture on the wall in the first screen has several possible animations. Tap and the mouse jumps up from the boat. Tap, and the octopus pops up and shakes the boat. Tap, and a whale pops up, and lifts the boat with his spray. 6. 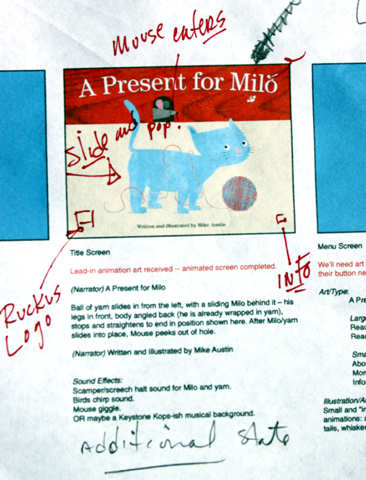 What was the time frame between presenting your book storyboard to Sequel Digital, and completing all the final pieces for Milo? Mike Austin: We had our initial meeting around the middle of August, and were ready for final testing around the end of November. For a few weeks I would get up at 4:30 a.m. and start drawing, and usually finished around 10 p.m. Regardless of how busy I was, I always made time for a short surf session in the middle of the day. 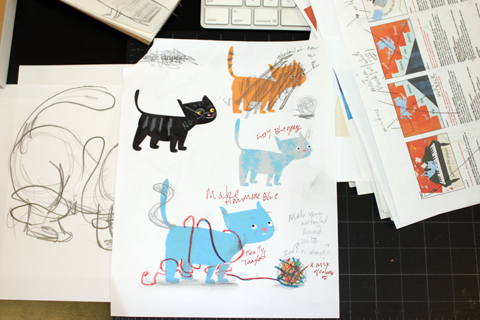 Joy Chu: You completed all art and animation within two months (of 2010)? Rubin Pfeffer: Because Mike’s storyboard was so sound, and we intended to keep this beautiful and effective by its simplicity, we had a pretty clear idea of what the app would be when we began. That, and Mike’s focus, plus Sequel Creative’s clear directives, enabled this to get to the market as quickly as it did.